Today marks 1 month of our engagement! In the past few weeks, we have visited a few venues and nearly nailed down the date and place for next fall. Then comes the fun part of planning and asking my bridal party to well, be in my bridal party! I have to admit, right after we got engaged, I went searching for "will you be my bridesmaid" cards to ask my favorite ladies. 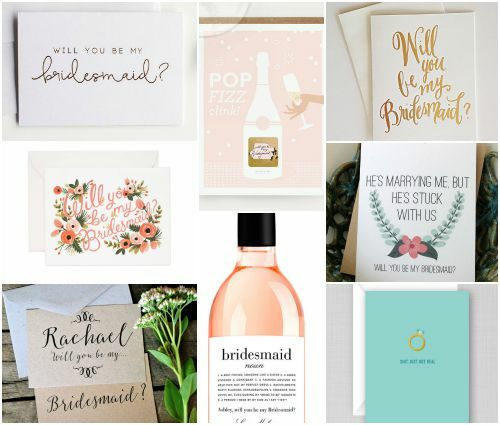 Let me tell you, if you search "will you be my bridesmaid" on Etsy or Pinterest, the most amazing ideas come up; the possibilities are endless (and kind of overwhelming)! I have a larger bridal party so I chose to do something on the small side for the ask so I can give them more fun goodies on the actual wedding day. If I could drop off wine to each of my 'maids, I would have done a custom wine label! I will share what card I chose after my bridal party gets their cards. How did you ask your bridesmaids to be in your bridal party? Love the card with the gold writing! Those are beautiful! And congrats on the engagement! Married life is awesome. Fall is the perfect time for weddings and anniversaries! super cute! love that you are having a big bridal party because I feel like you have been in ALL THE WEDDINGS!! !